Happy 88th Birthday Tampa Theatre! Join us in wishing the Tampa Theatre a VERY Happy Birthday!!!! 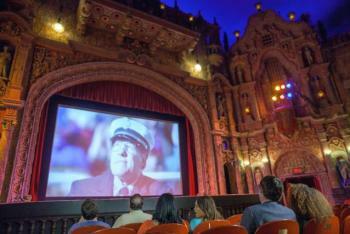 This year marks the 88th birthday of one of Tampa’s historic and favorite gems and most recently named “One of the Most Spectacular Theaters in the World” by CNN. Join in on the celebration, grab your friends and head down to the Theatre for a special (and FREE) screening of The Grand Budapest Hotel starting at 7:30 p.m.
Tampa Theatre members are welcomed to come an hour early (and bring a guest) for cake, ice cream and two free drinks!